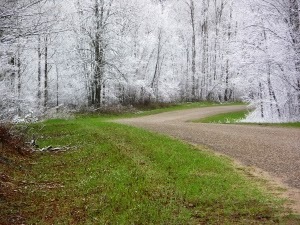 Michigan is a wonderful state with four distinct seasons... usually. But this summer... there have been so many nights with the mercury dipping into the forties, and I have to say... I don't mind it. I guess I'm only saying that because I didn't have my usual girls only camping trip this year. Too many conflicts among my college friends... an operation, a wedding trip, that kind of thing. Camping in this weather is no fun, and Lake Huron, where we normally head, is too cold for much in the way of swimming this summer. I haven't done much of anything for fun, except try to stay sane in the wake of family conflicts and inter family squabbles (Freezer I'll Shoot - November 5th, 2013). So the cool weather has been just fine for me! In fact the weather folks in Canada have coined a word for this month, calling it Augtober. But what I say is... is there ever really perfect weather? It's so seldom that you get the perfect day, and no one seems to agree on what the perfect day is, anyway! What IS perfect weather? My sister, Becca, gets cold if a breeze so much as riffles her hair. My friend Valetta likes a summer day cold enough to freeze her lemonade. I love a day when the wind makes the treetops toss and bend. And I love a summer day cool enough that a cup of tea in a thermal mug on the back summer porch is the perfect end of the day treat. How about you... how has your summer been so far where you call home? And do you have an idea of the perfect day, weather wise? 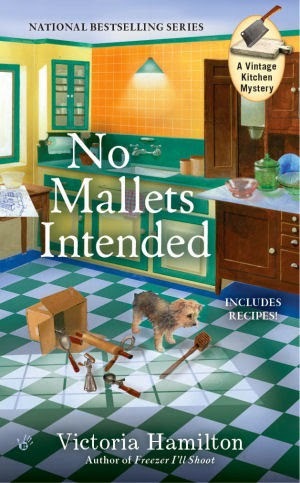 No Mallets Intended, Book 4 of the Vintage Kitchen Mysteries, will be out on November 4th! Please watch my monthly Killer Characters blog entry for EXCITING giveaways in October! The grass here in Threadville, PA, is surprisingly green for this time of year, which is kind of nice. Also, I've enjoyed opening my windows instead of turning on the AC. It's been a hot summer here in the SF Bay Area, and now we have the drought - so no rain and everything dusty and dry. Too many days of a/c, much prefer opening the windows when I can. We are just finishing up back yard remodel. Got delayed and didn't get to enjoy it in summer as planned but hoping if it's done by end of September as planned we will have some cool-enough-but-not-too-cool days to sit out there with coffee and a book and relax. I prefer the crispness of fall over the humidity of summer, but then I was born in October so maybe it is in my blood! Augtober? LOL! I love that. We've been having that kind of summer all the way down in Virginia. Well, maybe not 40 degrees at night but we've had more cool days than usual and the temperature never did reach 100 this summer. And now comes the warmth and humidity! I guess I can deal, since it is close to the end of Augtober... LOL... August. I'm a little late to this post but, here in North Carolina it hasn't been as hot as usual. It's just beginning to heat up, but usually it's continually in the high 80's to 90's from June, sometimes May. I'm so glad it took longer to heat up this Summer. A perfect weather day for me is around 73 degrees with a light breeze.